Photo: Thorsten Bolender (Area Sales Manager Manitowoc Cranes), Balàzs Séra (Sales Manager Nyìrség Nehézgép 93’Bt. ), Ferenc Séra (CEO Nyìrség Nehézgép 93’Bt.) 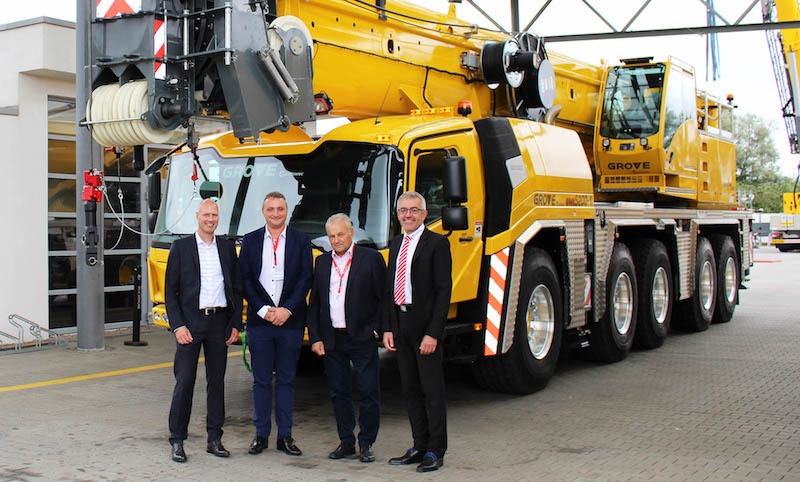 and Klaus Kröppel (Vice President Sales Mobile Cranes, Europe & Africa) in front of a Grove GMK5200-1 mobile crane at the Manitowoc factory in Wilhelmshaven.